A.J. Mahnke of Archbold putts one during the Division II Sectional Golf Tournament Thursday at Detwiler Park Golf Course in Toledo. He tied for first individually after shooting 76, helping the Bluestreaks claim the team title. 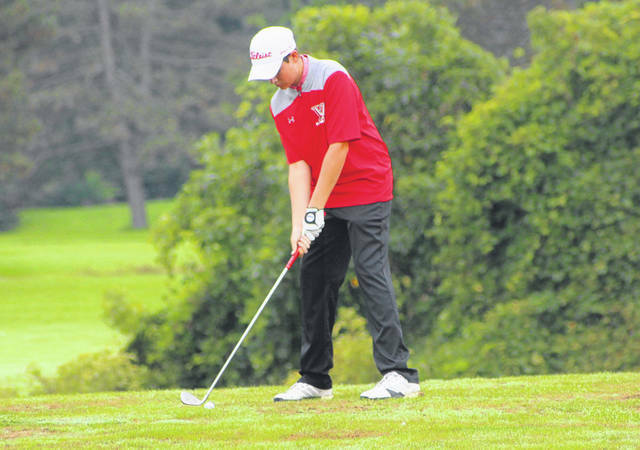 Dylan Grahn of Wauseon prepares for a shot at the 11th hole Thursday at the sectional tournament. He finished third to punch his ticket to the district tournament this Thursday. Caleb Leu of Wauseon off the tee at the 15th hole Thursday. He shot an 88 for the Indians. Archbold’s Mitch Grosjean chips one onto the green. He shot an 81 to finish seventh. 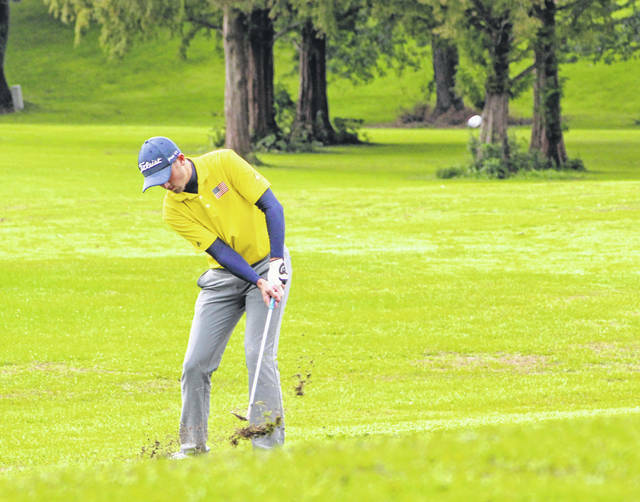 TOLEDO – Archbold continued its momentum from the NWOAL tournament last week, by winning the Division II Boys Golf Sectional at Detwiler Park Golf Course in Toledo Thursday. 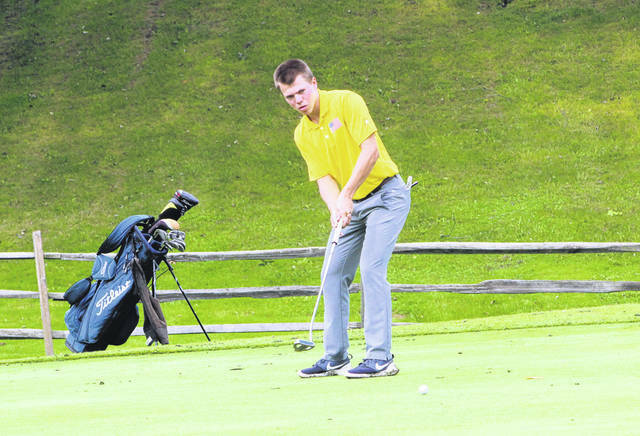 The Bluestreaks collectively shot a 324, 14 strokes ahead of runner-up Eastwood. Genoa also qualified for the district tournament, finishing third with a 339. The Bluestreaks’ A.J. Mahnke tied for first place with Noah Hahn of Eastwood. Both golfers shot a 76. Kreighton Sims of Archbold tied for fourth with an 80, Mitch Grosjean (7th) shot an 81, and Kade Kern (T-17th) 87. He did not score for the Streaks, but Josh Nofzinger came in a five-way tie for 23rd after posting a 90. Wauseon nearly qualified as a team as they finished fourth, however, the Indians had a individual qualifier. 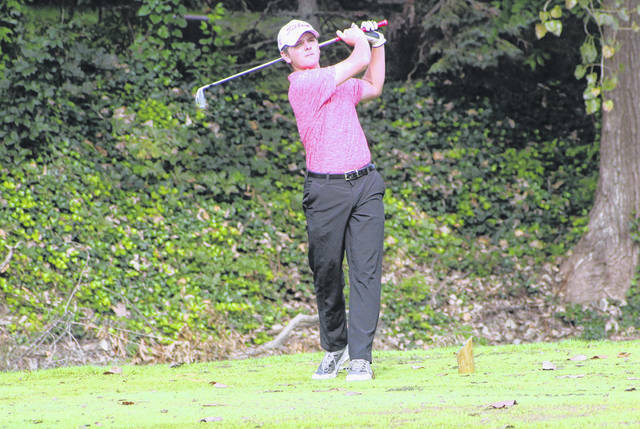 Sophomore Dylan Grahn posted a 78 to finish alone in third place. Also for the Indians, Caleb Leu (T-19th) shot an 88, while Trent Armstrong (T-23rd) and Eric Parker (T-23rd) each had a 90. Also qualifying in the county was Swanton freshman Garrett Swank. He tied for 10th with Robbie Bettinger of Eastwood, both shooting an 83. The Bulldogs were sixth as a team with a 348 team total. Carter Swank (T-17th) shot an 87 for Swanton, Austin Luce (T-19th) an 88, and Sam Betz (T-23rd) 90. Other qualifying individuals were Charlie Cronin of Toledo Central Catholic (T-4th) who shot an 80, and Hayden Rider of Lake (T-8th) at 82. The Division II district tournament is set for this Thursday at Red Hawk Run Golf Course in Findlay. 1. Archbold* 324 (Kade Kern 87, A.J. Mahnke 76, Kreighton Sims 80, Mitch Grosjean 81, Josh Nofzinger 90); 2. Eastwood* 338; 3. Genoa* 339; 4. Wauseon 346; 5. Napoleon 347; 6. Swanton 348; 7. Oak Harbor 365; 8. Lake 366; 9. Rossford 379; 10. Otsego 392; 11. Toledo C.C. 394; 12. Liberty Center 413. 1. A.J. Mahnke (Archbold) 76, Noah Hahn (Eastwood) 76; 3. Dylan Grahn* (Wauseon) 78; 4. Charlie Cronin* (Toledo C.C.) 80, Ethan Smith (Genoa) 80, Kreighton Sims (Archbold) 80; 7. Mitch Grosjean (Archbold) 81; 8. Hayden Rider* (Lake) 82, Tommy Giles (Genoa) 82; 10. Garrett Swank* (Swanton) 83, Robbie Bettinger (Eastwood) 83.